በሀገረ አሜሪካ መስፍን በዙ የሚባል ትንሽ ሰው አለ። ይህ ሰው ” ቲጂ ቴሌቪዥን” የሚባል በህውሀት የሚደገፍ ተንቀሳቃሽ መንኩራኩርና እሷን የሚሸከምበት ኮልኮላታ አለችው። የሁለቱም ቴክኒሻን፣ ፓይለት፣ ኮፓይለት፣ አስተናጋጅ፣ ተስተናጋጅ እሱ ብቻ ነው። ማንንም ስለማያምን አያሳፍርም። ለነገሩ የሀገሬ ልጆች እንደሰው ሰለማይቆጥሩት አይጠጉትም። በደንብ የሚያውቁት ደግሞ ” ከራሱ የተጣላ፣ግማሽ ሰው” ይሉታል። ቀትረ ቀላል! እናም ህውሀት የሸለመውና ግርማ ብሩ ወጪውን የሚሸፍንለት መንኩራኩርና ኮልኮላታ አለው። ታዲያ! መንኩራኩሯን ሲሾፍራት በጣም ስለሚፈራና ድንጉጥ ስለሆነ የቀድሞ ክልል አንድን የሚያክል ባይነኩላር በሁለት አይኖቹ ላይ ይገጥማል። ባይነኩላሩ ካሜራ ስለተገጠመለት የድፍረቱ ምንጭ ሆኖ ያገለግለዋል። በጥርጣሬ ለተመለከተውና መንኩራኩሯን ለተጠጋ ሁሉ ” እስቲ ወንድ ከሆንክ ጫፌን ንካ! ” እያለ በተደጋጋሚ ይማፀናል። ጫፋን ሲነኩት እንደ ጐማ ተጠቅልሎ ለመተኛት እየተዘጋጀ። በነገራችን ላይ ወገቡም ላይ ሻጥ ያደረጋት ዲሞፍተር አለችው። ርግጥ ዲሞፍተሯ ቀጥረው እንደሚያሰሩት ጌቶቹ የክርኑን እርዝመትና ክብደት ማሳየት አልቻለችም። አይቻላትም። ምድሪቷ የጌቶቹ ( የድሮ ጓደኞቼ) አይደለችምና! …ይህ አሜሪካ ነው!! 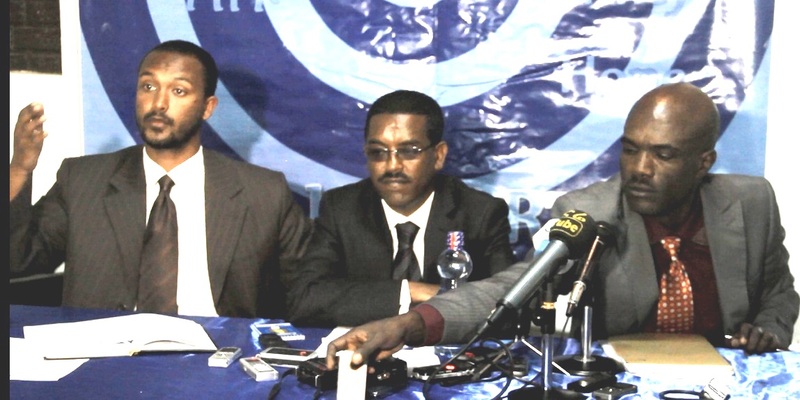 Blue Party was clear before entering into 2015 Ethiopian General Election as there are no capable and independent institutions to handle free and fair election even at the minimal standard. It was also clear that the regime is not ready to hold a free and fair election. Our understanding on non existence of a political platform to conduct a free and faire election was proved by the start of the election process. Our candidates were denied for registration and some others were illegally canceled by the Election Board after they were registered. The regime in fear of losing power has established a controlling system (1 to 5)to undermine freedom of citizens which is designed to make them forcefully vote for the regime otherwise threaten them to punish. The security forces and cadres of EPRDF continued in harassing, beating, arresting and some cases killing candidates and potential observers of opposition parties without any valid reasons and the order of courts. Independent medias and civic associations were not allowed to exist to teach people about the civil rights and possible alternatives. Public medias were hectic to reject our campaign messages from transmission using censorship which is totally prohibited by Ethiopian Constitution. In due time our active members were fugitive and arrested taken from their working areas or from their living homes. Some of them are still suffering in prison cells. Any election accompanied by such illegal actions and irregularities in no ways be free and fair. Consequently the result shows a total sweep and a “100%” win by the regime. This is a message of disgrace ascertaining that a multi party system is over in Ethiopia and the reign of a single party system affirmed to flourish. This is a dark time for Ethiopians and a shame for the friends of Ethiopian Government. As the result is so embarrassing, the government has lost the confidence to publicize the full outcome of the election. In the first instance, large section of the population including Blue Party’s potential voters were not registered to vote due to losing confidence on the election process. It was only members of the ruling party and some others who were forced to register as voters who had the right to cast their vote. During our campaign, large number of the society became aware of the alternatives presented by Blue Party and all the votes Blue party has gained from this election are a swap from ruling party supporters. We are therefore grateful for all our voters as you choose us willingly not forcefully and for purpose not for any material rewards. Blue Party would like to extend its gratefulness to all members, candidates, activists and party observers who were beaten, arrested, detained and harassed during the whole election period as you were vital to make our Party popular, reliable and trustworthy by the general public. Due to all mentioned irregularities and illegal actions taken by the ruling party and by other weak institutions to hold free and fair election, Blue Party does not accept the process as free and fair and at the same time does not accept the outcome of unhealthy and undemocratic election result. The Government to be established by this rigged vote won’t have legitimacy as it denied the will of the people. Blue Party continues on its endeavor to bring freedom and justice to Ethiopians as a whole and calls upon all citizens to join it on its continuing struggle to secure our freedom. ኢትዮጵያ በክብር ለዘላለም ትኑር !!! በተቃራኒው እኛ ግን ትናንሽ ልዩነቶች እያለያዩን በጋራ መንቀሳቀስ አልቻልንም። በአገር ቤት ሰማያዊ፣ አንድነት፣ መኢአድ ፣ ትብብር …እንዲሁም ሌሎች ለምን በአንድ ላይ መስራት አልቻሉም ? መድረኮች ከነሰማያዊ ጋር ለምን መስራት አልቻሉም ? ወደ ዉጭ አገር ስንመጣ ደግሞ ሸንጎ፣ የሽግግር ምክር ቤቱ፣ ግንቦት ሰባት፣ ሶሊዳሪቲ ….ለምን አብረው ፣ አንድ አማራጭ ኃይል አቋቁመው መስራት አልቻሉም? ሁሉም ነጻነት ፈላጊ አይደሉም እንዴ ? ሁሉም ፍትህና ዴሞክራሲን ናፋቂ አይደሉም እንዴ ? ሁሉም ለአንዲት ኢትዮጵያ የቆሙ አይደሉም እንዴ ? ታዲያ ለምን መተባብር ቸገራቸው ? ገዢዎቻችን ለክፋት አንድ ከሆኑ፣ እኛ ለመልካም ነገር እንድ መሆን እንዴት ያቅተናል ?